Network measurer OpenSignal has had a look at the performance subscribers are getting from AT&T’s whizzy new 5G Evolution service and it’s nothing special. In other words there’s nothing special going on. If you’ve got a phone that supports LTE-Advanced you’re going to get around 29 Mbps download speed regardless of whether your operator cheekily rebrands it on your phone screen. Unless you’re on Sprint, however, which has a best effort of around 20 Mbps (see table). AT&T was universally mocked when its bright idea of rebranding LTE-A at 5G E first emerged. Sprint, of all companies, even decided to call the lawyers in to challenge the claimed deception, but AT&T continues to insist it was a great idea. Its marketing department presumably won’t be thanking OpenSignal for this latest revelation, but what did they expect? It took a look at the two operator groups that have networks in both countries and found they all deliver relatively low mobile broadband speeds in those two countries. 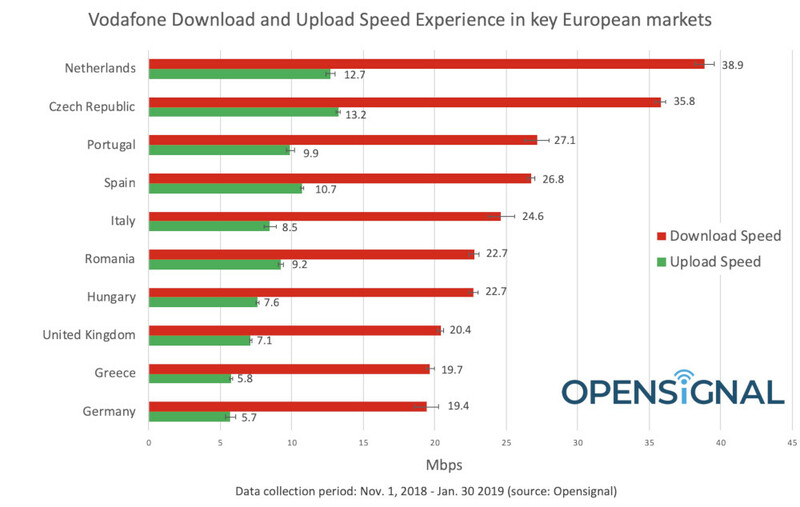 As you can see in the charts below, Telefónica does a fair bit worse in the UK and Germany than in Spain, but maybe that’s to be expected since it’s a Spanish company. However the trend continues with Vodafone, for which the UK and Germany are two of its worst performers. 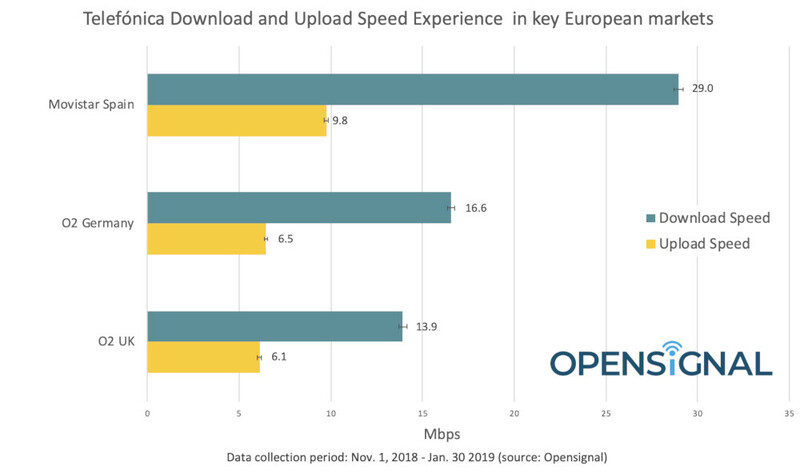 “So what’s the reason for these relatively poor mobile broadband speeds in Germany and the U.K.?” said Opensignal Analyst Peter Boyland. “It certainly isn’t market maturity or competition, as both countries have had mobile networks for decades and levels of competition, numbers of operators, etc. are comparable with their neighbours. “Topographically, both countries have challenges in terms of size and population density, but no more than, say, Italy or Spain. It would be easy to blame poor performance on underinvestment in network infrastructure, but the reality is a combination of many factors including regulation, availability of spectrum, and mergers and acquisitions among network operators. Something’s certainly going on when two major operator groups can only manage around half the performance in the UK and Germany as they can in their leading markets. As Boyland said this situation will be the product of a number of factors, but our gut-feel is that regulation and spectrum availability are probably the most significant of them. Telecoms.com periodically invites third parties to share their views on the industry’s most pressing issues. In this piece Ian Fogg, VP of Analysis at OpenSignal, urges the telecoms industry to accentuate the positive when it comes to 5G. As 5G arrives in 2019, the early hype is beginning to be replaced by criticism that early 5G deployments will not be so different to 4G. The implication is clear: 5G isn’t a big deal. The problem with this analysis is that it confuses potential initial 5G teething issues with the real importance of 5G for the future. 4G networks are becoming overloaded. Today, we can see enormous mobile network experience differences by comparing otherwise similar cities. The success of the smartphone boom and cheaper and cheaper data tariffs are continuing to drive up mobile data usage. Consumers need 5G to relieve pressure on existing networks, otherwise speeds and other mobile network experience factors will worsen. The mobile industry needs 5G, or congestion and a declining mobile experience will make it hard for operators to maintain existing revenue levels, let alone increase them. Mobile network vendors need 5G to succeed to support capital expenditure by operators. We at OpenSignal can see these real-world mobile broadband challenges across the world. We see the fastest speeds and best latencies in cities where operators have deployed solid 4G networks and priced data at a sustainable price (not as a bargain). In South-East Asia, the 4G Download for smartphone users in Singapore is far faster at 47.7 Mbps than compared with similar-sized and similarly technologically advanced Hong Kong, where networks enable an average 4G download experience of just 17.3 Mbps, or just 36% of the speed in Singapore. South Asia offers another example: New Delhi users experience 4G Download Speeds of just 7 Mbps, where speed differences by time of day highlight the load India’s users place on networks, This compares with nearby Karachi’s average 12.9 Mbps 4G Download Speed. Across Europe’s advanced Nordic markets, the mobile network experience is considerably better in Oslo, Norway (59 Mbps average 4G Download Speed in our measurements) than in Helsinki, Finland (36.7 Mbps). Although Finland is an advanced mobile-centric country, hosting the HQ of Nokia — one of the three leading network infrastructure companies — a combination of cheap data and little interest in fixed services puts more load on Helsinki’s mobile services, contributing to significantly lower speeds in the Finnish capital than in nearby Norway. In North America, Toronto’s smartphone users enjoy 4G download speeds 33% faster than New York’s, where OpenSignal analytics show 4G Download Speeds of 41.1 Mbps and 30.8 Mbps respectively. Initial 5G new radio deployments – “real 5G” – aim to tackle these real-world problems. Enhanced mobile broadband services – targeting smartphone usage – and fixed wireless are the two use cases covered by the 3GPP’s initial 5G standards. While the more ambitious goals for 5G are to drive Internet of Things (IoT) markets, such as industrial automation or autonomous driving, they are not yet covered by ratified 3GPP standards. They are a work in progress which will arrive later in the 5G era. While 5G is more efficient with its use of spectrum, but unlike previous network generations that is not the primary way that 5G will support a better mobile broadband experience for smartphone users. The 5G standards enable the use of much higher frequencies for mobile use cases. These frequencies have much greater capacity than the existing LTE frequencies. And, they have not previously been used for mobile. The 3.4 Mhz – 3.8 Mhz channels will be the most popular globally and will balance mobility with high capacity. The millimeter wave (mmWave) frequencies available now in North America and select countries will offer even more extreme capacity and higher speeds but will be much more challenging to deploy because of their line-of-sight propagation characteristics and the disadvantage of being easily blocked by walls, or even by smartphone users’ hands, or even by a tree’s leaves. Over time, 5G launches will improve mobile latency – a measure of network responsiveness – which will make everything from web browsing to voice over IP (VoIP) communication work more smoothly. The greatest initial impact will likely be improving the user experience of multiplayer mobile action games on a mobile connection. Today, many Fortnite or PUBG players choose to use Wifi in preference to cellular connections because of lower and more consistent latency. As 5G rolls out, we will see latency improve on mobile networks too. Smartphone users will see some improvement when connecting with initial 5G networks, but the full 5G latency benefit will only arrive once operators deploy a 5G network core and launch “standalone” 5G where a smartphone is able to connect to just a 5G signal. This contrasts with 2019’s 5G “non-standalone” launches where a smartphone will connect to a 5G carrier for data transmission while maintaining a simultaneous 4G carrier connection to enable management by an operator’s existing network core. While the 4G technology we use today is also called “Long Term Evolution”, the 5G era will have its own extended evolutionary cycle. The 5G experience we will all enjoy 10 years from now will be considerably improved from the early 5G launches we will see in 2019. When you hear about 5G teething problems this year, remember it’s going to improve and 5G will be with all of us for the long term. And, also remember why the industry needs 5G now: to support the mass of current smartphones by adding mobile broadband capacity to reduce congestion, and to enable operators to continue to deliver a great mobile network experience as smartphone data usage continues to grow. At Opensignal, Ian and his team develop new insights and analysis using Opensignal’s mobile analytics data. Prior to joining Opensignal, Ian created product strategy recommendations and market analysis reports for 15 years at Forrester, IHS Markit and Jupiter Research. As Senior Director at IHS, Ian led the team responsible for forecasting mobile network infrastructure, telecom operators, mobile apps, smartwatches and smartphones. 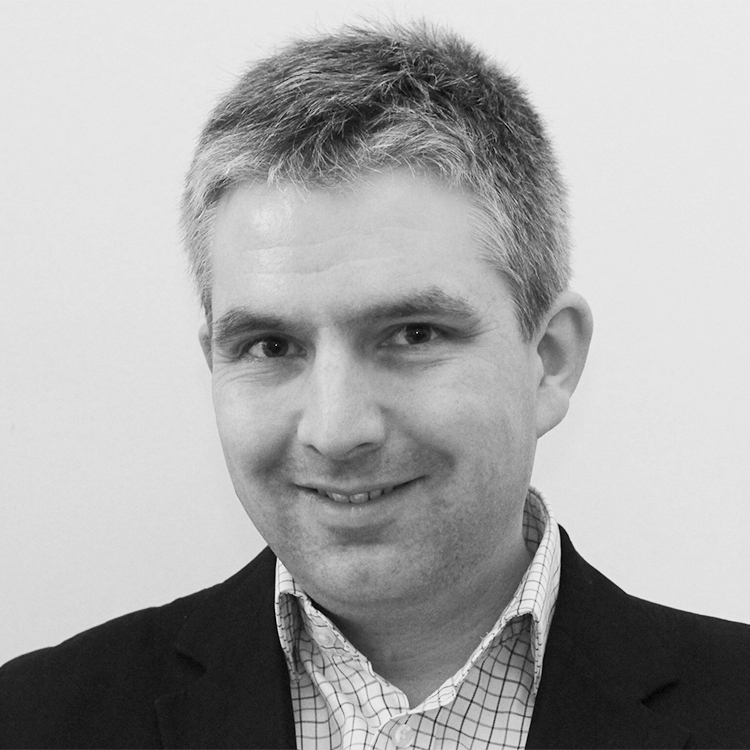 Ian has 9 years of experience in product and marketing roles at mobile operator Three, cable operator Cable & Wireless and device maker Psion. Ian has end-to-end expertise across the mobile and telecom market. He is an energetic and passionate speaker and is regularly quoted in business media, including: CNBC, Financial Times, BBC, AP and Reuters. 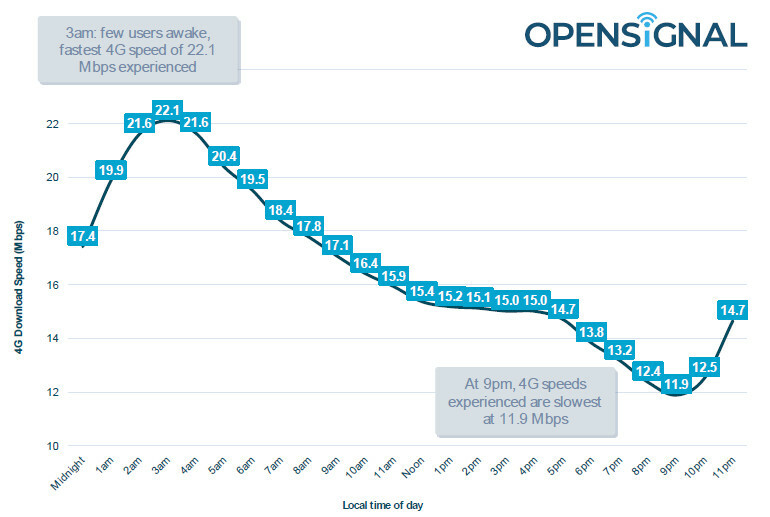 Network monitoring outfit Opensignal has published its latest global report, which concludes congestion is messing with the 4G user experience. In some countries the 4G download user speeds experienced by consumers can vary by 30 Mbps over the course of the day thanks to network congestion. European countries seems to be the best at dealing with this congestion, with the US in the middle and some Asian countries struggling. Globally, peak traffic speeds are around have the level of the quietest times. It also notes that 5G is best suited to cities because of the shorter range of the higher frequencies, which is handy because that’s where the worst of the congestion is. 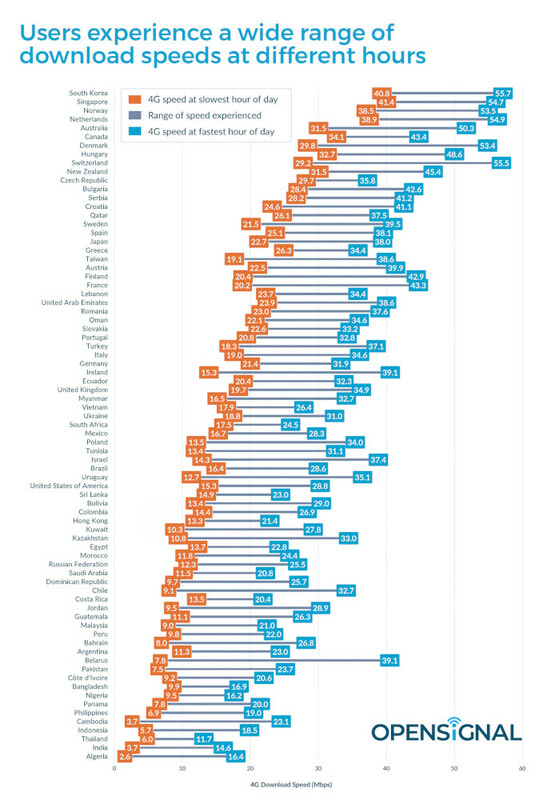 Here’s a handy chart showing the speed ranges experienced by country. Looks like Belarus could do with a bit of 5G magic. Mobile analytics company OpenSignal has had a look mobile and wifi performance around the world and concluded mobile is catching up fast. In 33 countries, according to the report, smartphone users get faster average download speeds from their mobile network than from wifi. The country with the greatest discrepancy in favour of mobile is Australia, where average speeds are 13 Mbps faster than wifi. In most countries the respective data rates seem to be pretty similar but wifi still prevails in some, including the US where it’s still 25 Mbps faster, on average. You can see all the data in the table below and the significance of it to OpenSignal is that wifi is no longer always preferable to mobile, when it’s available. A decade ago mobile data was just a slop, expensive stopgap in between wifi hotspots for when we absolutely had to get online to check the football scores, or whatever. Now the only reason to prefer wifi in a lot of countries is that its unmetered, but that is likely be less of a factor in the 5G era, with unlimited tariffs likely to proliferate. For that reason OpenSignal reckons operators and smartphone makers will need to have a rethink about mobile offload, to avoid prioritising lower-performance networks. Network rating outfit OpenSignal has started measuring ‘video experience’ as well as raw network performance and found they don’t necessarily correlate. A new report entitled The State of Mobile Video ranks a bunch of countries according to their mobile video experience on an arbitrary scale of 0-100. This takes into account not just download speed but things like ‘traffic management’ (often referred to as throttling) and latency. These can all contribute to things like buffering and slow load times, all of which affect the overall video experience. As you can see from the scatter graph below, taken from the report, there is a fair bit of variation in the correlation between download speed and video experience. 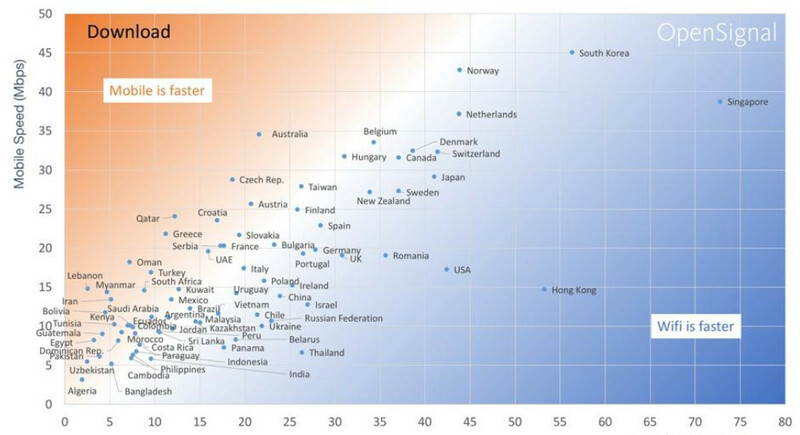 If the correlation was exact then you’d just have a straight diagonal line, but as you can see the country with the fastest raw speed – South Korea – isn’t even in the top ten for mobile video experience. Conversely the Czech Republic has been found to be top of the pops when it comes to mobile video experience but is also just outside the top ten for download speed. 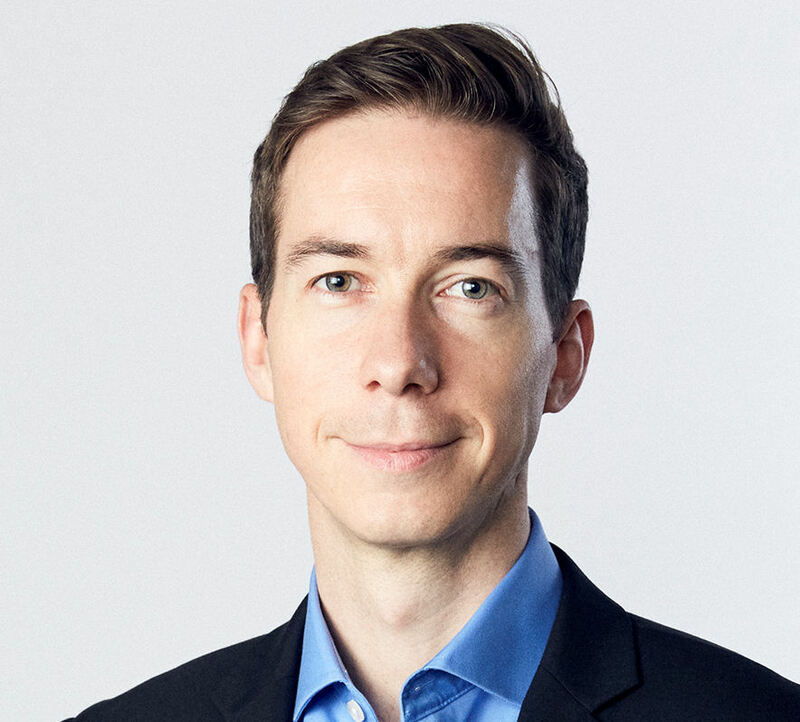 We spoke to OpenSignal CEO Brendan Gill and he revealed the main reasons for these discrepancies are traffic management and latency. Another outlier country is the US, which has a relatively low mobile video score compared to download speed. A major reason for this is probably unmetered tariffs that theoretically allow unlimited video streaming but in practice feature fairly extensive restrictions on bandwidth. This practice is understandable but there is an argument that if those services are being positioned as ‘unlimited’ then there’s some mis-selling going on. Latency is most pertinent when it comes to shorter video clips typically accessed over social media. If you’re scrolling through your social media feed you’re probably not prepared to wait more than a second or so for a clip to start playing. While this is probably a sad indictment of the modern attention span and certainly qualifies as a first world problem, that’s the environment we’re operating in and apparently US load times aren’t great. Network monitor OpenSignal has released its mobile networks update for Belgium and it reveals BASE as made the biggest improvements. OpenSignal spent 90 days measuring the Belgian market from the start of May. It found that BASE has taken the lead in the key 4G download speed metric, having been level with Orange six months ago. BASE now averages 45 Mbps, up 5Mbps from the last time, while Orange has fallen off to a mere 34 Mbps. Proximus is right in the middle with 39 Mbps. None of these are bad scores, it should be noted. An OpenSignal test on your correspondent’s phone running the EE network in north Herefordshire yielded 24 Mbps. The overall Belgian speed rankings reflected the 3G scores, as you would expect, while coverage was pretty identical for all three. Here’s some more data. Can we ever hope to eliminate mobile notspots in London? Telecoms.com periodically invites third parties to share their views on the industry’s most pressing issues. In this piece Roberto Valerio, Brendan Gill, Co-founder and CEO of OpenSignal looks at the state of London’s mobile notspots and what can be done about them. This summer we’ve seen the launch of the ambitious Connected London programme, which hopes to drive improvement in the UK’s capital through digital technology and data. This includes tackling mobile broadband “notspots” – where a mobile network connection is absent or extremely weak or patchy. But even in the best-served metropolitan regions, can mobile operators ever hope to achieve 100 percent connectivity? The elimination of notspots is a commendable goal – but unfortunately, it’s not a very realistic one. Notspots will never go away completely as they’re part of the nature of building cellular networks. We believe it’s unlikely any operator will ever achieve this goal, or even reach 99 percent network coverag1e in urban areas. The ‘holy grail’ score of 100 percent connectivity may be just that – a myth. Places where operators offer no coverage. This is what everyone thinks of as a notspot. For business or logistical reasons operators simply don’t extend their networks to cover particular areas. An urban-focused operator may not offer services in smaller towns and villages, or there may be obstacles to infrastructure rollout such as planning permission. Dead zones created by network interference on the edges of cells. These are especially prevalent in urban areas, where cell towers are crowded closer together and the ‘borders’ are harder to anticipate and mitigate due to high buildings and other obstacles. In-building dead zones where signals can’t penetrate, for instance elevators and basements. This problem is obviously magnified in an urban region, and is increasing as higher-bandwidth spectrum with poorer building-penetration capabilities are sold for mobile use. Temporary notspots generated when the network becomes too congested, and customers are shunted down to 3G or 2G, or disconnected completely. This occurs when data demand simply exceeds network capacity. Operators can do a lot to mitigate each of these issues, such as deploying small cells or repurposing lower frequency spectrum from 2G, but some problems will always persist. When you consider the number of factors that can cause mobile coverage notspots, added to the increased use of higher bandwidths for mobile (which can help operators increase network capacity, but offer lower propagation) and ramping consumer data demand, notspots can never ever be completely eliminated. OpenSignal’s 4G availability metric measures the proportion of time users with a 4G device and subscription are able to get an LTE connection. As such we can use this as an indicator of how far an operator has come toward eliminating notspots on their 4G networks. 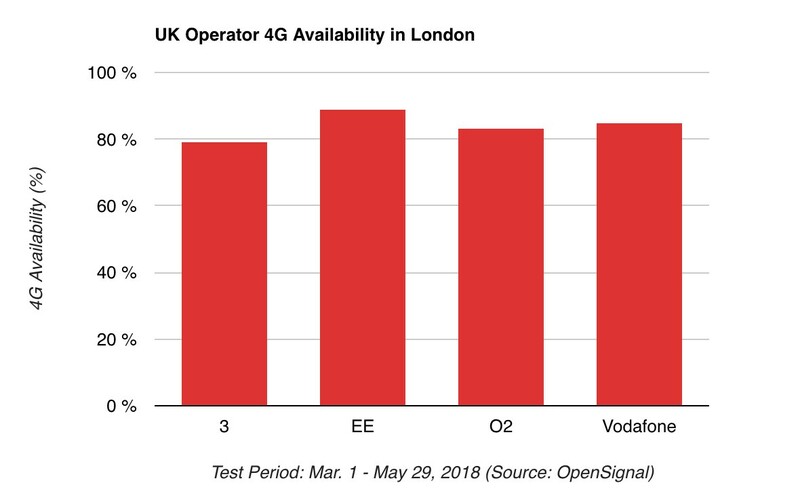 To illustrate how close the U.K.’s operators have come to that goal, we’ve taken a look at how the U.K.’s four national operators performed in London in 4G availability. EE scored the highest in the capital with LTE reach of nearly 89 percent in our measurements, while all four players were over 79 percent. That means London still has plenty of notspots on its 4G networks. But London isn’t the only city with 4G notspot problems. South Korea topped our 4G availability metric in our most recent global State of LTE report, and came fourth of 88 countries for 4G download speed, making it arguably the most advanced 4G market in the world. But the global leader in LTE reach scored 97.5 percent in our 4G availability metric, while the capital Seoul reached 97.9 percent – two percent off the 100 percent mark. As 4G networks mature and operator focus begins to shift to 5G and beyond, it’s probable that we’ll have to continue to contend with notspots, even in the world’s most connected cities. Brendan Gill is co-founder and CEO of OpenSignal, a mobile analytics company that measures users’ real-world mobile experience by analyzing billions of measurements from smartphones worldwide. OpenSignal believe seeing how the network performs directly through users’ eyes is the key to building better wireless networks. OpenSignal’s insights are used across the industry by mobile network operators, regulators and analysts. Download the OpenSignal app on Google Play and the App Store. 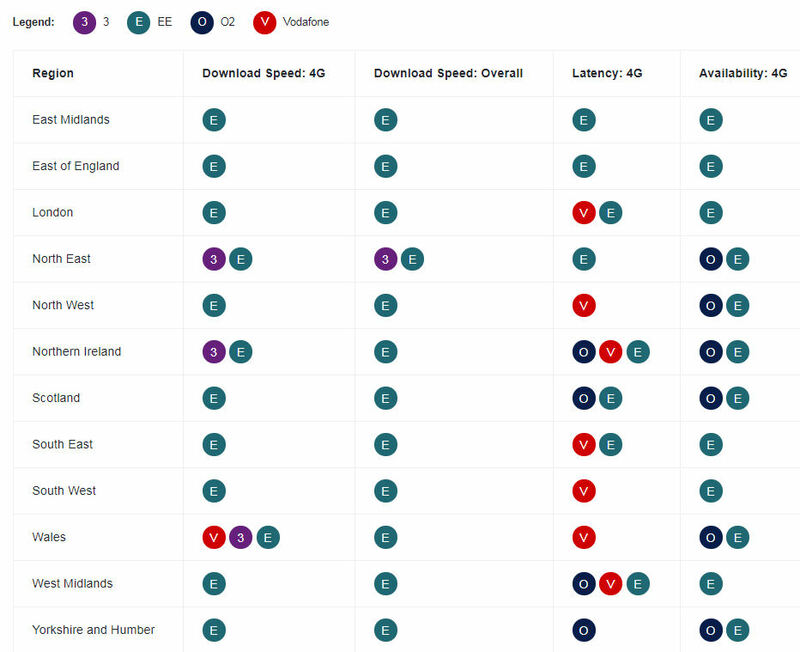 You can see the charts for each of the nationwide 3G and 4G metrics below, but to cut a long story short EE won nearly all of them. It also leads in 4G availability with 86.6%, followed by O2 on 83.4%, Vodafone on 79.5% and Three on 66.6%. However our average 4G speed of 23.1 Mbps apparently lags even Armenia and Mexico. Maybe the extra 4G spectrum O2 just got hold of will help it do better in 4G next time. 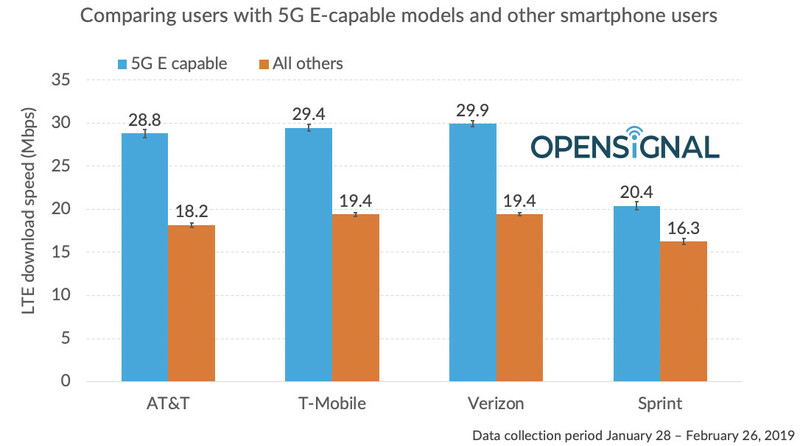 OpenSignal has released some more granular insight on the performance of the top four telcos in the US and it is very clear there are two tiers; Verizon and T-Mobile US are best-in-breed, AT&T and Sprint are not. When the firm released its State of Mobile Networks in the US report T-Mobile US was recognised as the leader for pretty much everything, but when you look deeper into the statistics in the individual regions, the competition is a lot closer than top-line figures would suggest. Verizon beats T-Mobile US in some areas, is level in others and not far off the pace in the rest. While the leader in the race is a lot closer than perhaps it might have been initially presented, what is clear is that AT&T and Sprint are not in the same league. The tables below demonstrate this point quite effectively. On the availability side of things, the distinction between first and second tier is very clear. What should be noted is that the last 12 months have seen a great level of improvement from Sprint and the team has said it will continue investments to improve this coverage. Perhaps it will close the gap over the next year, but that is not a promise it will be able to compete on the speeds front. Interestingly enough, while the US is one of the best in the world for 4G coverage, it doesn’t compete on the global stage when it comes to download speeds. Again, we can see there are two tiers in the operator rankings when it comes to speed with T-Mobile establishing a bit more of a buffer over Verizon in the top tier, but the overall average falls below the 16.9 Mbps global average. Admittedly, many of the countries above the US are smaller and do not face the same challenges when it comes to geographical variety, but this is a pretty poor performance from a country which claims to be at the front of the digital revolution. A couple of weeks back we noted the companies who are performing best in their individual markets are the ones which are investing in their networks and not getting distracted by other more colourful ventures. This is another story which adds credibility to the theory. With 5G just around the corner, we would hope AT&T doesn’t get drawn into a long and bitter legal battle with the Department of Justice over its acquisition of Time Warner as that could spell disaster for its standing in the 5G world.